English and Russian (without simultaneous interpretation and translation). As well known since the late 1980s studies in the history of Central Asia have made great progress not only in Central Asian republics but also in other countries in the world. New research trends and increasing diversity in research topics are presented in such epistemological works as Stéphane A. Dudoignon & Komatsu Hisao eds., Research Trends in Modern Central Eurasian Studies (18th-20th Centuries): A Selective and Critical Bibliography of Works Published between 1985 and 2000 (2 vols., Tokyo: The Toyo Bunko, 2003-2006) and Central Eurasian Reader prepared by Stéphane A. Dudoignon (Klaus Schwarz Verlag, 2008). When we look at this remarkable progress from the view point of Japanese historiography, we notice that two factors played great role during the last two decades. First is the academic cooperation between Uzbek academic institutions, among others the al-Biruni Institute of Oriental Studies, and Japanese universities. In fact a number of joint projects have been realized and a lot of Japanese doctorate students have enjoyed research opportunities in Uzbekistan, and they constitute the main body of Central Asian studies in Japan. Second is Franco-Japanese cooperation that has developed intensively based on affirmative efforts among rather younger scholars and has brought about fertile products and invaluable networks. 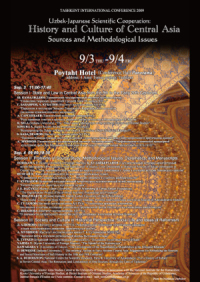 This is the reason why we decided to hold an international conference dedicated to the history and culture of Central Asia, retrospecting our achievements during the last two decades and expecting further development in our research field.